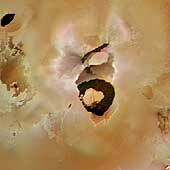 Jupiter's moon Io [EYE-oh or EE-oh] is one of the most exotic places in the solar system. It is the most volcanic body known, with lava flows, lava lakes, and giant calderas covering its sulfurous landscape. It has billowing volcanic geysers spewing sulfurous plumes to over 500 kilometers high. Its mountains are much taller than those on Earth, reaching heights of 16 kilometers (52,000 feet). Io orbits closer to Jupiter's cloud tops than the moon does to Earth. This places Io within an intense radiation belt that bathes the satellite with energetic electrons, protons, and heavier ions. As the Jovian magnetosphere rotates, it sweeps past Io and strips away about 1,000 kilograms (1 ton) per second of volcanic gases and other materials. This produces a neutral cloud of atoms orbiting with Io as well as a huge, doughnut shaped torus of ions that glow in the ultraviolet. The torus's heavy ions migrate outward, and their pressure inflates the Jovian magnetosphere to more than twice its expected size. Some of the more energetic sulfur and oxygen ions fall along the magnetic field into the planet's atmosphere, resulting in auroras. Io acts as an electrical generator as it moves through Jupiter's magnetic field, developing 400,000 volts across its diameter and generating an electric current of 3 million amperes that flows along the magnetic field to the planet's ionosphere. 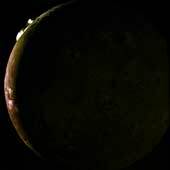 Auroral Glow: This eerie view of Io was acquired by the Galileo spacecraft while the moon was in Jupiter's shadow. Gases above the satellite's surface produce a ghostly glow that can be seen at visible wavelengths. 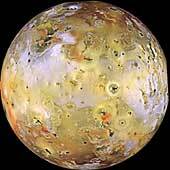 The vivid colors are caused by collisions between Io's atmospheric gases and energetic charged particles trapped in Juiter's magnetic field. The green and red emissions are probably produced by mechanisms similar to those in Earth's polar regions that produce aurora. Bright blue glows mark the sites of dense plumes of volcanic vapor, and may be places where Io is electrically connected to Jupiter. On January 7, 1610 Galileo Galilei observed three pinpoints of light strung out in a line next to Jupiter. The next evening, these stars seemed to have moved the wrong way, which caught his attention. Galileo continued to observe the stars and Jupiter for the next week. On January 11, a fourth star (Ganymede) appeared. After a week, Galileo observed that the four stars never left the vicinity of Jupiter, appeared to be carried along with the planet, and changed their position with respect to each other and Jupiter. Finally, Galileo determined that what he was observing were not stars, but planetary bodies that were in orbit around Jupiter. This discovery provided evidence in support of the still heretical Copernican solar system and showed that everything did not revolve around the Earth. In 1676 a Danish astronomer Ole Romer was able to make the first accurate measurement of the speed of light by using eclipse timings of the Galilean satellites with Jupiter's shadow. Another discovery was made by Pierre-Simon de Laplace during the late 1700s when he deduced that the orbital periods of Io, Europa, and Ganymede are nearly in a perfect 1:2:4 ratio. In 1920 this knowledge paved the way for the first estimate of the satellites' masses within an accuracy of 20%. Finally in 1979, the Voyager spacecraft flew past the Jovian system, took high-resolution pictures of the moons, and conducted experiments that provided the first accurate measurements of the moon's dimensions and mass. These in turn were used to calculate the mean density of Io (3.5 g/cm3), Europa (3.0 g/cm3), Ganymede (1.9 g/cm3), and Callisto (1.8 g/cm3). 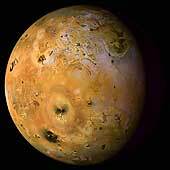 Based on density, surface composition analysis, and gravity data, Io appears to be a rocky silicate rich body that has a dense iron, iron sulfide core that extends halfway to the surface with a partially melted silicate rich mantle, and a thin rocky crust. The lower density of Ganymede and Callisto suggest that they are composed of lighter elements, most likely water in some form. Why are there such differences among the four Galilean satellites? During the early formation of the solar system, Jupiter would have been very hot. This may have prevented lighter elements from condensing at the inner orbits. The mini system of Galilean satellites orbiting Jupiter resembles that of the solar system with the rocky, dense planets at the innermost orbits and the light, least dense planets at the outer orbits. Io Rotation with Enhanced Colors. 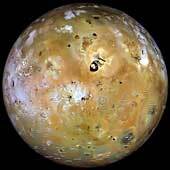 This image is the highest resolution image ever taken of Io. The resolution is 5.2 meters (18 feet) per picture element.